You open your eyes to see a place that you’ve never seen before. The stonework as far as you can see is old and has been here for a long time. As you stand up and dust yourself off a old man approaches. An old man you ask yourself? Were you not just on a airplane? Being a fan of video games you figure the old man is a good sign as this must be a dream and he’ll most likely be the one to help you out of this mess and send you on your way. Reality sets in not that long after as you come to realise that this is not a dream but your new reality as you are saved from a dangerous situation by a mysterious woman in a Japanese high school girl uniform (so... not a dream. You're in heaven? - ed). That's when you realise you are a stranger in a weird place called Sword City. Related reading: Matt's review of Demon Gaze on the PlayStation Vita. 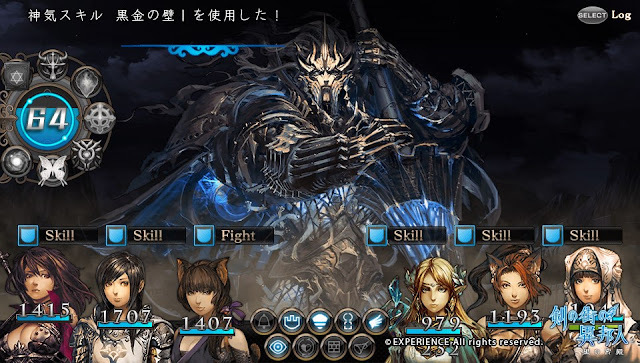 Stranger of Sword City is a first person dungeon crawler that is brought to you by the same team that created Demon’s Gaze for the PlayStation Vita. Put into the role of the only survivor (or are you? 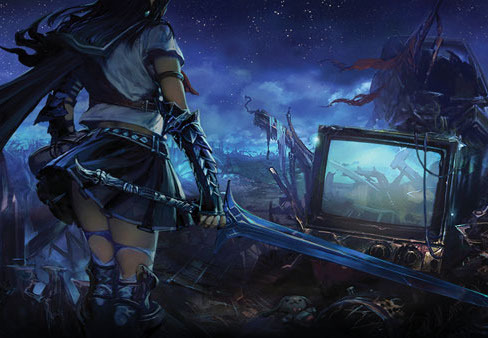 Cue Lost theme) of a plane crash from the “real world,” you become an inhabitant of a new location known as Sword City, and are tasked by Rui (the woman that saves you at the outset), to hunt down "Lineage" creatures in order to harvest blood crystals. And then you're let loose to begin the adventuring. As you can probably tell from the aesthetics, this is quite a dark game. I don't want to make comparisons to the similarly Japanese-take-on-European-medieval-aesthetics Dark Souls series but... yeah, the game knows how to get its Souls on. Interestingly, age is a key mechanic in this game. Younger allies that can join you on your journey are full of vitality, have a much larger number of life points, and take less time in order to earn their way back to the land of the living. Middle aged or old allies have fewer life points and take longer to achieve their goals, but have experience on their side. Finding a balance between the two can be difficult at times as you'll often need to settle for what's available to you when setting out, but being as balanced as possible is important, as you'll need allies on both sides of the age spectrum to cover all bases. But yes, that focus on age, as well as the thematic interest in topics such as mortality can be quite nihilistic at times. Because the game is as challenging as dungeon crawlers are well known for being, being properly prepared for an outing is important. However, heading over to the blacksmith however will prove to be fruitless as most of his gear and even his item selection is way out of your budget. Instead, being self sufficient and acquiring supplies while in the field is key, and this means you need to be ambushing monster and creature caravans. While exploring the reaches of each area there will be places where members of your party may notice something a tad different about an area. Taking the time to stop and investigate these areas will reveal that they make the perfect locations for an ambush. Using the ability to hide and wait to pounce when the moment is right will be fundamental in order to better equip both yourself and the rest of your party. Again, it's quite a grim, dark theme (you're literally playing robbers), but it's also an interesting twist on the equipment grind that most JRPGs offer. Ambushing enemies is still a gamble though. An ambush can only be successful if the party itself is stealthy and manages to get the drop on the enemies. Otherwise the enemy will in fact be able to get a drop on you. So figuring out if you're in the right position to handle an ambush is a key strategic decision that you'll need to make. You'll be able to decide if pouncing is the right decision based on the treasure chest that you see them carrying. There's far less risk involved in attacking a caravan carrying a wood chest than there is taking on a group with a gold chest. On top of that, you'll need to time the attack right, based on where the leader of the caravan is marching. Even if you manage to overcome the caravan, some chests are also trapped. Poison, explosions, sharp pains, teleportation, or even a round battle with a mimic (a monster shaped like a chest), can leave a scar or three if you fail at that last hurdle. Finally, after all that, if you're successful, you'll get new loot to add to the party. 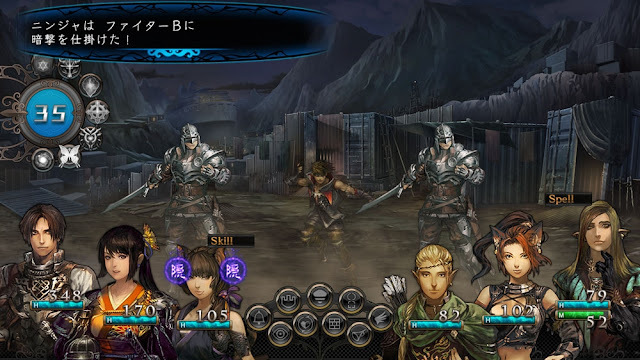 If it sounds like a lot of work that's because it is, compared to what we normally see in JRPGs, but as the likes of Etrian Odyssey have shown, crawler fans tend to like the slow grind, so I think they'll take to this system with relish. With all of the exploration and the ambushing, combat will become second nature though never does it become tedious. Combat plays out in a fairly standard way for a crawler, with you and your allies split between a front and a rear line and your enemies across the way at times in multiple ranks to the point that their rearguard is not even visible - yes, hordes are a thing. At the beginning of every turn you will get to decide on your party’s actions and once decided the round will play out between both you and your enemies before the next one starts if required. Battles can be protracted affairs, but thanks to the general difficulty of them they can also be tense, which is nice because it's rare that a JRPG can make regular encounters this interesting. Related reading: And for a classic crawler experience, be sure to check out the early Wizardry games on PC. Being a stranger in this land has perks but there are those above you that may bestow upon more divine powers in recompense for bringing them blood shards. There are three different God-like beings that you can support by providing them with the blood shards. None hide the fact that they each want them for their own particular reasons, though none will ever try to force you into handing them over making it clear that the choice belongs solely to you and you alone. The divine powers they offer in return give you an edge in battle through morale points that increase as you provide more shards. There are limits though - once you've earned a reward from one of the deities, you won't be able to go to one of the others for their equivalent of that reward. Furthermore, keeping an eye on the morale gauge is also important as it costs morale points to participate in ambushes and the like. Stranger of Sword City is a stellar, and surprisingly unique example of a dungeon crawler. It's dark, grim and gothic at times, and revels in the same difficulty that Experience Inc was able to throw at players in Demon's Gaze, but its unique mechanics and themes make it one of the most boundary-pushing dungeon crawlers we have seen in recent years.